Fountain of the Tortoises At California and Taylor Streets, Huntington Park is a charming, distinctly cosmopolitan public park at the top of Nob Hill on the site of a once great mansion. Features here include a tree lined court, fountains, playground, and formal lawns. At the front of the park, where parlors were located in Crocker's palace, is the beautiful bronze Dancing Sprites. The centerpiece of the park is a copy of Landini's 1585 Fountain of the Tortoises (seen here). The original is at the Piazza Mattei in Rome. 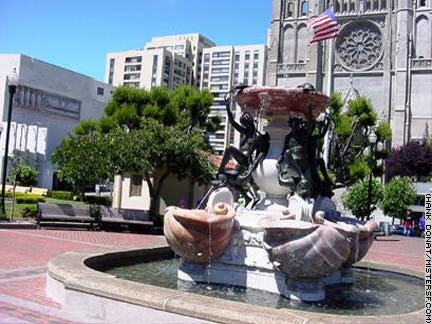 Bella Farrow - the socialite and philanthropist whose Nob Hill Foundation oversaw a recent restoration of the Huntington Park fountain - says plainly, "Ours is better." Mister SF agrees. For weary grown-ups, no visit to Huntington Park is complete without a ride on the children's swings.